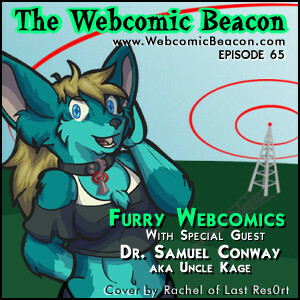 Dr. Samuel Conway, aka Uncle Kage (UncleKage.com), joins Fes, Tanya, and Mark to discuss furries, furry fandom, and furry webcomics. Darcy (Code Name: Hunter), Rachel (Last Res0rt), and Trpdwarf (Around the Fur Studio) join in the call. Milestones: Apple Geeks (500 pages), Yet Another Fantasy Gamer Comic (1000 strips), The Ord (100 strips) , Gets a Job (100 strips). This week we set our Beacon Searchlight on Krazy Bov. We also would like to Spotlight: Dead Winter. News: Karen of Planet Karen had her apartment burned down. Zortic mentioned in his Journal that Susannah Kist needs our help. Additional Links: CNN Coverage of Anthrocon 2009. C.J. 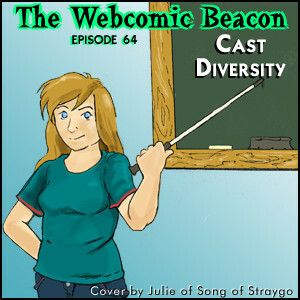 (Steal This Comic), Swankivy (Negative One), and Jinx Tigr (Tally Road) call in to talk with Fes, Tanya, and Mark about cast diversity. Julie Sydor of Song of Straygo drew the cover for the show. Milestones: ETI PI (100 updates), Eros Inc (100 comics), Faulty logic (100 updates), and House Pets (100 comics). 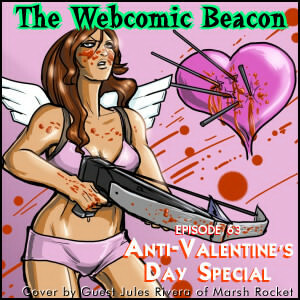 It’s an Anti-Valentine’s Day Special with Jules Rivera (Marsh Rocket) joins Fes and Mark to discuss bad relationships and terrible romance in webcomics in bitter celebration of Greeting Card’s Day. Milestones: Nerf Now (1 yr), Boxcar Astronaut (100 strips), Slightly off topic (100 strips). This episode is brought to you by: Last Resort, Ned the Chainsaw Guy and Action Flick Chick! Menage-a-3 (NSFW), Penny and Aggie, Marry Me, No Pink Ponies, Inverloch, Mega Tokyo, Candi, Namir Deiter, You Say it First, Badly Drawn Kitties, Fur Will Fly, Ozy and Millie, Ganbare! Shimura-san, Anders loves Maria, Least I can do (NSFW), Questionable Content, Capes n Babes, Night Zero, Union of Heroes. 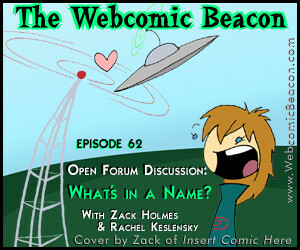 Webcomic Beacon #62: Open Forum: What’s in a Name? Zack (Insert Comic Here) and Rachel (Last Res0rt) join Fes, Tanya, and Mark to discuss some of the meanings behind, and reasons for, the names we pick for our webcomic characters. We are ALSO joined by several callers that were listening to the show LIVE on our Sunday Afternoon Broadcast! What were YOU doing? Watching the “Super Bowl”? Cover by Zack of Insert Comic Here.